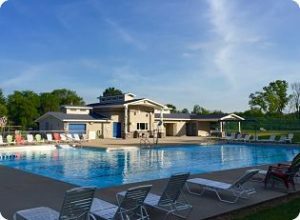 POA members may enjoy open swim, swim lessons and pool parties at the Hidden Valley Lake Pool. The complex includes tennis and basketball courts, a covered picnic shelter with 8 tables, electricity and a grill, a playground, ample parking and bicycle racks. Residents must present a valid HVL ID card for each family member, which will be scanned for entry. See the Residents page to learn how to obtain ID cards. A drivers license is not acceptable ID for pool entry. Pool hours are noon to 8 p.m. daily (unless otherwise posted, weather and patron usage permitting) from Memorial Day weekend through Labor Day. Current Pool Schedule for the remainder of the season is below. Check the Pool Calendar at the bottom of this page for pool closures for special events. Swim team: contact HVL Swim or visit the HVL Gators Swim Team website. Won’t be long before we are all enjoying summer in Hidden Valley ! The pool will open Saturday May 25th at Noon .. Please make sure to have a HVL ID for each family member when visiting the pool or beach. There is always a lot going on around HVL during the summer. A great way to keep up to date is by checking the website www.hiddenvalleylakeindiana.com for updates . Below is some general pool and beach information, reminders , important dates and swim lesson information. If you have any questions please contact Angie Ruberg Recreation Manager at aruberg@comcast.netor 812-537-1707. Swim Lesson Registration – Tuesday May 21 & Thursday May 23 from 4:30 pm-7:30 pm at the HVL Pool. To enter the pool you must have your Hidden Valley Lake ID with a barcode and scan it at the front desk. A driver’s license is not an ID that will be accepted for entry to the pool. Reminder: you must be a member in good standing to be granted access to the pool. All residents must have their guests check in with a lifeguard to sign in and pay appropriate guest fees. not an ID that will be accepted for entry to the Beach. The lifeguards or HVL Deputies will be checking IDs. Guests are permitted at the beach with an HVL resident that has an HVL ID. Guest fees are collected daily. You may contact the beach lifeguard shack during the summer at 812-537-4151. Interesting in renting the pool for a private party? Residents in good standing may rent the pool from 8:00pm – 10:00pm for a private party , birthdays, family gathering or team parties. There is a Facility & Staffing Fee charged which depends on the number of lifeguards required. The number of staff will depend on the size of your party; there is a minimum of 2 guards per party required. For more information or to schedule a party contact Angie Ruberg @ aruberg@comcast.net pool 812-537-1707. Swim lessons will be offered for children who have turned 3 years old by January 1, 2019 . There are several options to sign up for this summer! All registrations must be done in person at HVL Pool. Registration for HVL Residents is Tuesday May 21 & Thursday May 23 from 4:30pm- 7:30pm and then will be accepted again during normal operating hours. We will continue registration until each class is full. There is limited space available for each class; registration is first come first serve. Classes for all skill levels. If you are not sure what level your child should be in we will be able to help you at registration. The cost is $40 a child per session for HVL residents. *Non-residents may sign up beginning May 23 for these classes however they may be put on a wait list and contacted if spots are available. The cost for non-residents is $50 a child per session. For all classes children must be at least 3 years old as of January 1, 2018. (Proof of age may be required) We offer classes for all skill levels. Level 1 –Designed for children who need to become better acquainted with the water. Skills taught include putting face in the water , blowing bubbles, bobs, water safety rules, supported floating & kicking & jumping off the side & the diving board .Other skills may be added as these are achieved are achieved. Level 1 -Designed for children who need to become better acquainted with the water. Skills taught include putting face in the water , blowing bubbles, bobs, water safety rules, supported floating & kicking & jumping off the side & the diving board .Other skills may be added as these are achieved are achieved. • Non-resident guests must be accompanied by a POA member with a valid HVL ID card. • Residents may obtain 6 free pool/beach guest passes per season at the POA Office. • Residents may purchase a seasonal guest pass for non-resident children/grandchildren. • No more than 8 guests per member per day allowed, except by special permission. • No refunds or rain checks. View the Pool Safety Rules & Guidelines. Swim lessons for all skill levels are available throughout the season for ages 3 (by January 1 of current year) and up. All registrations are in person at HVL Pool, 20698 Lakeview Drive. Registrations are accepted during normal pool operating hours. We will continue registration until each class is full. There is limited space available for each class, so registration is first-come, first-served. If you are not sure what level your child needs, we can help you at registration. Registration forms are available, or download 2019 Swim Lesson Registration Form. Cost: $40 per child per week. For more info, contact the Pool Manager. POA members may rent the pool for birthdays, family gatherings or team parties. Pricing varies and is based on number of party guests. To schedule a party, check the pool calendar below. For more info, see the Pool Party Guidelines & Agreement form or contact the Pool Manager.